Ambon (Agenzia Fides) - Nurturing and promoting inter-religious dialogue is the way to build social harmony and heal the wounds of war: says to Agenzia Fides Bishop Petrus Canisius Mandagi, at the head of the diocese of Amboina, based in Ambon, capital of the Moluka Islands, the Indonesian islands tormented by a civil and religious conflict in the years 1999-2002. Since then "the Church has been committed to strengthening good relations with other faiths in the islands", says to Fides Bishop Mandagi. "Religious harmony is something to be lived with concrete actions", explains Bishop Mandagi. So when Muslims, who are the majority of the population, hold their meetings, Christians help them and support them, and vice versa: this creates bonds of friendship and understanding, he adds. The Bishop usually visits Muslim families "as a sign of goodwill, understanding and brotherhood so that tensions and divisions can be resolved through mutual interaction and sharing", he says. For the Bishop of Amboina, the key to maintaining community harmony is to "make good friendships with everyone, regardless of their religious background". What is important is trust towards one another. We have to work for this day by day, so that all kinds of misunderstandings can be avoided". Today parishes, priests, religious, laity, institutes, associations and schools of the diocese support the efforts of Islamic-Christian dialogue. In January 1999, a quarrel between a Christian and some young Muslims, which broke out in Ambon, was the spark that caused a sectarian conflict which exploded among the faithful of different religions that raged for four years. Hundreds of churches and mosques were destroyed and thousands of houses razed to the ground. At least 5,000 people were killed and half a million were displaced. 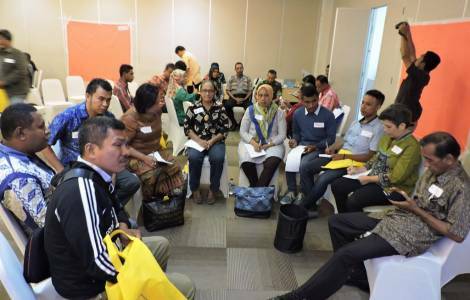 In mid-February 2002, together with religious and civil leaders, Bishop Mandagi took part in mediation talks held in Malino, in the province of South Sulawesi. The meeting ended with an agreement that ended the conflict.